Artwork by Tano Bonfanti depicting Vorlandelyn featured in the upcoming Automatonera anthology. One of the key influences in Numenera is the work of French artist Jean Giraud, or as he was commonly known, Moebius. Before I was a fan of Numenera, I was a fan of Moebius whose revolutionary graphic novel work in Franco-Belgian comics paved the way for his various science fiction storyboard/concept work in the film industry which included Alien and Alejandro Jodorowsky’s aborted interpretation of Dune whose story was told recently in Frank Pavich’s documentary. Moebius could literally tell an entire story with one page prints which covered the spectrum of highly detailed art to surreal and fantastical illustrations that conveyed strange, unfamiliar but interesting people, creatures and worlds. 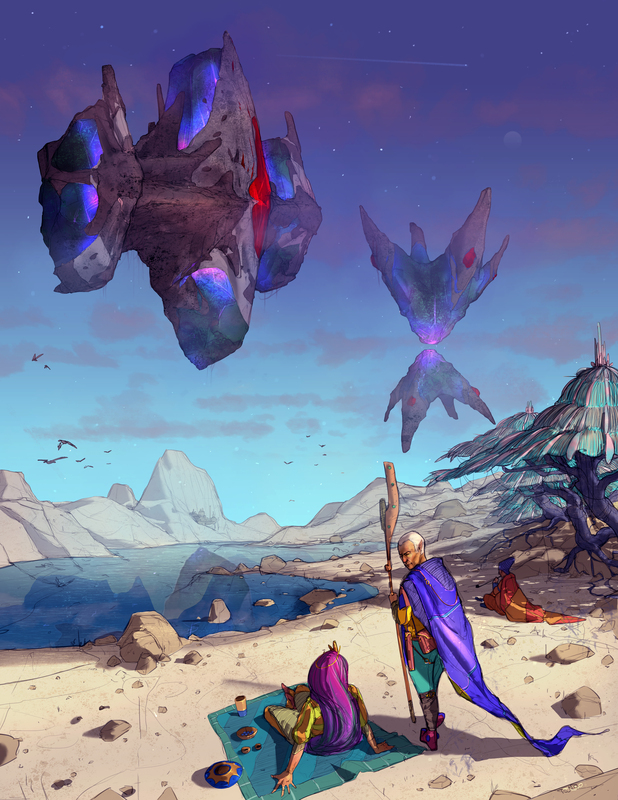 The DNA of Moebius’ influence is evident in Numenera from the depictions of the characters’ clothing design (especially the cover of the rulebook) to the setting where weird people and cultures are just around the corner. When I first conceived the idea of creating the Automatonera anthology, I knew I wanted one of the adventures to be influenced by Moebius’ work, so I searched for an artist who had similar qualities, yet retained his own distinct style. My search led me to Argentinian artist Tano Bonfanti who is the lead artist for “The Dress Weaver of Vorlandelyn,” one of the adventures found in the Automatonera anthology. Bonfanti’s first piece, featured on this blog post, shows the island chains of Vorlandelyn as well as the floating islands that contain an archaic soundscape museum. Although there are similarities to Moebius, Bonfanti has his own technique, using a very solid and colorful base to compliment a good portion of his exotic, strange, and inviting science fiction work. As for the adventure itself, it centers around an automaton dress weaver who “dreams” of the perfect dress for a member of royalty. The automaton recruits some of her close friends to find the items she needs for the dress. Suffice it to say, the numenera needed to produce the dress are of an odd nature and not easily attainable.